HSPD-5, Management of Domestic Incidents. HSPD-5 requires all Federal Departments and agencies to adopt the NIMS and use it in their individual domestic incident management and emergency prevention, preparedness, response, recovery, and mitigation activities, as well as in support of all actions taken to assist State or local entities. This plan also illustrates the intended methods of incorporation of the NIMS into the State’s plans, procedures, policies, and training programs. fully trained in the NIMS. 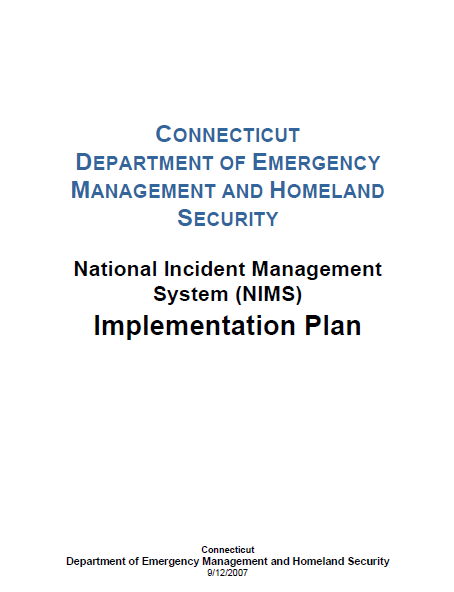 and State Emergency Operations Plans (EOPs) must be evaluated for NIMS incorporation. NRP and any internal emergency plans such as COOP Plans. the implementation phases will overlap in order to speed and strengthen the process.